I wrote a story for Campers Village on setting adventure resolutions for the new year. I liked my advice so much I decided to take the challenge myself to complete everything on my resolution list. The Resolutions are below along with what I plan to (hope to) do to accomplish them. Now I tag you to take up the challenge too! And I'd love to hear about your resolutions so please leave comments at the bottom. Every big trip we do as a family in the wilderness or backcountry challenges us and causes us to grow. Some of the big trips being planned this year are a family winter ski trip into Lake O'Hara to stay at the Elizabeth Parker Hut and a summer family backpacking trip on the Icefields Parkway to stay at the Bow Hut. I want to try running an intermediate Class II river this summer on my stand up paddleboard. I find the Bow River through Calgary to already be a challenge and apparently it's only Class I, so I have my work cut out for me. I would like to learn to kayak this year. Not sure if I will take lessons or not, but it's a new skill for sure. Noah is also learning to kayak so we'll be learning together. I am determined to plan a trip with our friends that live in Saskatchewan this summer, even if I have to travel to SK to do it! Best friends should be seen at least once a year! Next weekend I am going on a girls' ski weekend with 27 other ladies. I'd say this counts for this resolution! Last year we had 8 girls. This year we have 28 girls for the annual girls' ski weekend!! We are staying at the Rampart Creek Wilderness Hostel on the Icefields Parkway this month. It will be our first time visiting this hostel and our first time exploring this part of the Icefields Parkway. I really want to camp at Wasa Lake in British Columbia this summer. The campground has a warm lake, a bike pump track right in the campground, and we've never camped here before. We're hoping to actually spend a whole week in the Columbia Valley. Make a new outdoor friend! Join a meet- up group, form a club, connect! Rock Climbing. My husband loves it, my son loves it, and I find it boring to tears. But, I'm gonna have to learn to like it. I even got a new helmet for Christmas to show my intention to learn to appreciate it a bit more. This one is easy for me. I do this every week with the Calgary Outdoor Playgroup Community as a leader and a major trip planner. Easy peasy for us. 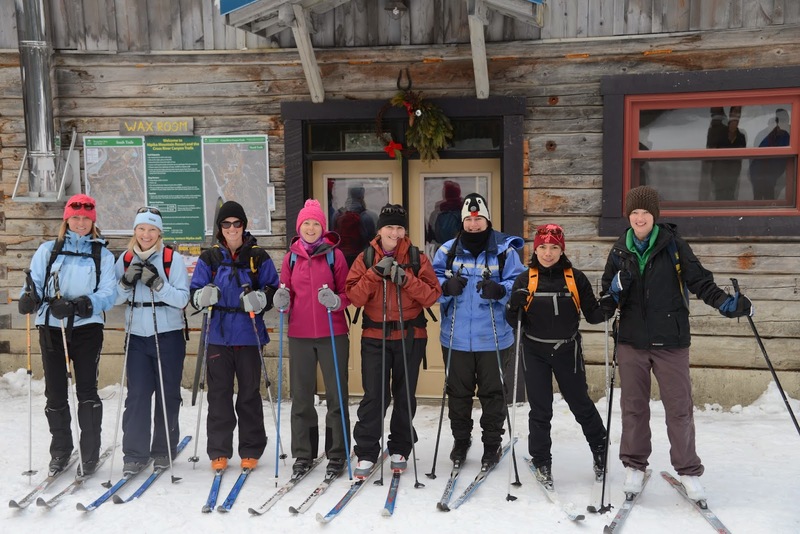 We've got 10 wilderness trips planned this winter between all members of our family. We'll ski into Lake O'Hara in April, hike into the Bow Hut in July, and hopefully hike into Egypt Lake in September. We're also planning an overnight paddling trip this summer and might plan an overnight family backpacking trip in June. Noah and I will both be working on our mountain biking this summer. We started riding at the same time and hopefully will keep progressing together. (Until Noah passes me in ability.) Other than that, every month is an opportunity to teach Noah new things outside. Try… (stand up paddleboarding, rock climbing, horseback riding…) Anything! I'm addicted to trying new things so I have no doubt that I will be trying new things this year. As will Noah! My goal for the new year is to improve upon embracing each moment out on the trail, at camp, and on the adventure. Last year I got a copy of the new Bow Valley Mountain Bike Guide Book and we are still working our way through it. The goal this summer is to finish all the easy trails as a family in the book. What's on your Adventure Resolution List?? Hostelling with kids is super easy if they are over the age of 6. They can stay in a dorm room at any hostel. Otherwise, you just have to look for hostels that have private rooms. Lots of wilderness hostels here do. Sometimes you can even rent an entire dorm room for 6 or 12 people and bring other friends with you. One of your best posts ever, Tanya! Very inspiring! I have yet to set some outdoor goals, but I should! Thanks Meghan. That means a lot to hear that you like this post. I am gonna have a go at backpacking this year. Just a single night to start off with. I have always been an overlander, and although that takes you off the beaten track I'm pretty keen to camp and explore where there is no track at all! Wasa Park looks very pretty. I've never been there before... time to add it to my list of must sees! Happy exploring!